A New Year and a new medium. I have started Vlogging. My first video went up on You Tube this morning. I hope that you will check it out. It speaks of some of my favorite things. First up is a favorite Christmas mug. This Snowman tea mug was purchased at Macy’s for Christmas 2013. It is a Susan Wingert design by Certified International. I like the mug for its size and the little extras. It has a lid that helps keep my tea warm. It also has a tea ball for steeping loose tea with an attached snowman. 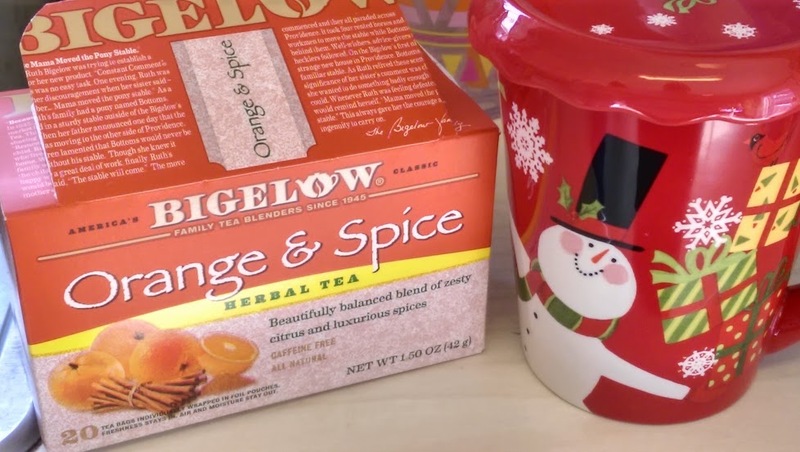 Inside the cup for most of this season has been Bigelow Tea in the flavor Orange & Spice. I like this tea because it is herbal and has no caffeine. It is a nice morning flavor, sometimes I add a bit of locally sourced honey to it. I have Celiac Spruce disease which means that I am allergic to Gluten. Finding great baked goods is difficult. Last summer I discovered Cookies and Brownies from the WOW Baking Company. This season has been full of White Chocolate Cranberry as well as Chocolate Chip Cookies and Brownies. They also have Oatmeal Raisin and a Sugar cookie. They are soft cookies that freeze well. I have found them at Whole Foods and Natural Grocers. They are about $7-8 a box. They can be ordered on line at WOWBaking .com. I love to crochet, but long spans of time crocheting can make my hand ache. 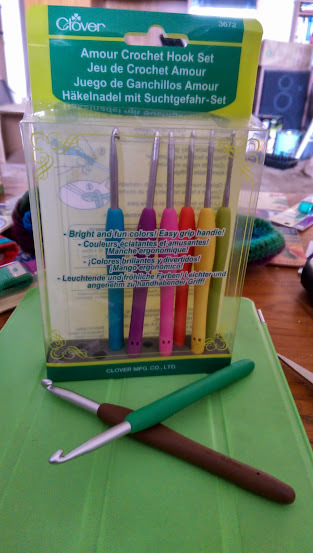 I found that Clover has a great set of crochet hooks. These standard sized hooks have a comfortable rubber-like grip on them. The set is available on Amazon. Recently I found that they are available at my local Joann Fabric store in both the standard aluminium sizes and in the steel hook sizes. They run about $8 each there. I figure that I will acquire them a few at a time with my 40% off coupons. The nice thing about them is that they are standardized by color, for instance the brown hook will always be a J size. 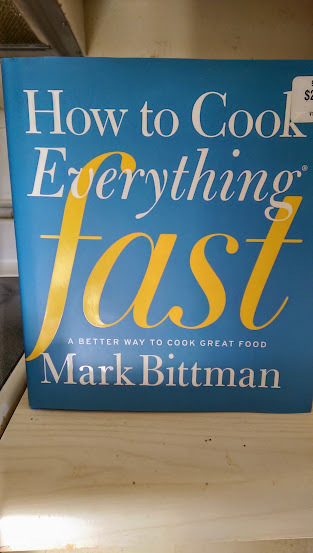 This season’s favorite new cookbook is Mark Bittman’s, How To Cook Everything Fast. I picked it up at Costco for about $22. It is a large tome of wonderful recipes and great illustrations. The recipes are augmented by suggested variations. It has been a lot of fun to cook from it. I love to read but do not always have the time I would like to enjoy it. Over the past decade I have found that Audible Books has been a great addition to my life. I have just finished Dan Brown’s Inferno. It is a 17+ hour book that captured me from the first chapter. It is one of those books that has been on my to read list for too long. I enjoy Dan Brown’s books. If you check out Audible through this link I’ll get a free book to read! I feel the need to start doing something about the Pins I have on my Pinterest Pages. Who am I? I’m Karen Pennington part of the Mrs Beasley Omnimedia Family. This blog is designed to do two things. The first is to get the hundreds of items from my Pinterest Pages collection to reality. The second is to share the inspirations that will lead to newly generated pins from me. My Pinterest Pages span a variety of subjects. Crochet, Sewing, Quilting, Embroidery, Jewelry Making, Paper Craft, Drawing, Pen Work and Cooking/Food. I have a lot of fun with all of these interests. I tend to get into one subject at a time. So you might see me making a bunch of cards or a whole group of Crochet projects and think well where are the quilts and embroideries? They will come. Food will be sprinkled throughout since cooking seems to be a daily thing in my life. Not all will be blog-worthy attempts. You will see a lot of Gluten Free happening and healthier stuff. Treats need to be just that a TREAT, and occasional item, not a blog full. So follow me on Pinterest. Feel free to make suggestions along the way. This should be a lot of fun.